I was told by many, many, many people that this book was much better than the first, and is apparently the best book in the series... While sitting in bed last night, about halfway through the book, I doubted that very much. It wasn't that I was disagreeing, not yet, but I found it hard to believe that this book could be considered the best of all five of the books in this series that Maas had published. I found the beginning of Crown of Midnight slow, it was great to see Celaena completing tasks that were more suited to her line of work than simply battling other people for a certain title, but I found myself constantly putting the book down. It was a bit slow to say the least. I'm fully aware that if a book contains too much action then it's not a good read in the end, but there were moments where I could have easily put the book down and gone right to sleep. And there ends my criticism of this book. Quite literally. I don't know whether I was just tired, or busy, or any other excuse but I finished the other half of the book in a matter of hours and was so interested in everything that was going on, I didn't want to put it down for anything. As this is the second book in the series, the rest of this review could be considered spoilers, but I will try my best to limit the way in which I say things if you do want to continue... You have been warned! One of my favourite aspects of this book was getting to see Celaena actually unleash her trained assassin side. Up until this point she has always been lethal, but there were always hints that she wasn't really trying or that she could have been worse. Something happens in Crown of Midnight which forces Celaena's hand, and has her turning someone that I was slightly scared of? If I had met Celaena in that moment, I don't know whether I'd have fainted from fear or started running. Fast. I think "turning into" isn't the best description, but, if I remember correctly, Maas sort of describes it like a fog is lifted or a veil removed and I think that's a better way of looking at Celaena, but I wasn't really sure how to best explain it. We get to see MORE MAGIC! I am a big lover of fantasy novels, especially for the magical aspects. And within this book we get to see three kinds (okay, so I can't explain them without being to spoiler-y but at the same time I'm not sure if they'd be considered different kinds, but if you've read the book you'll sort of understand me?) and they are all great and frightening and I cannot wait to see more of it in the following books. Seriously, bring on more magic. This definitely feels like a pointless part of the review, because I'm not really saying anything at all about the magic, but just know that it was well written, creative, and amazing. Obviously, since Throne of Glass was the first book, there's only so much Maas can tell us about her characters before her writing is considered to be full of 'information dumping', which is something that a lot of readers cannot stand in the slightest. So within this book, we see a lot more character development, not only from Celaena but also Chaol and Dorian. My heart has never hurt so much. The book is written in 3rd person and because of this Maas is able to jump between certain characters POVs within a chapter and can seamlessly tell a moment or event from multiple character's perspectives, I felt myself not knowing who I was most worried about and saw a lot more innocence than I expected to see. As I saw/read in Throne of Glass, Maas' writing is beautiful, and the same holds true for Crown of Midnight. They way in which Maas built the world around Celaena was, to me, perfect. The history was only told when needed, but it didn't feel as though it was written out of convenience to the story line. It honestly felt real? (I promise I don't need to be reminded that this story is fictional... Perhaps I do, oh well.) A big pet peeve of mine is when, in a book, I get to a part in the story where the protagonist finds out a very important piece of information and then someone is there to conveniently tell them that it's that way, or it happened because of a certain moment in history and the puzzle is solved. No. No thank you. Thankfully, this was not the case in Crown of Midnight, instead, I the story unfolded in front of me, with many hints and nudges in certain directions without having to hit readers over the head with it. 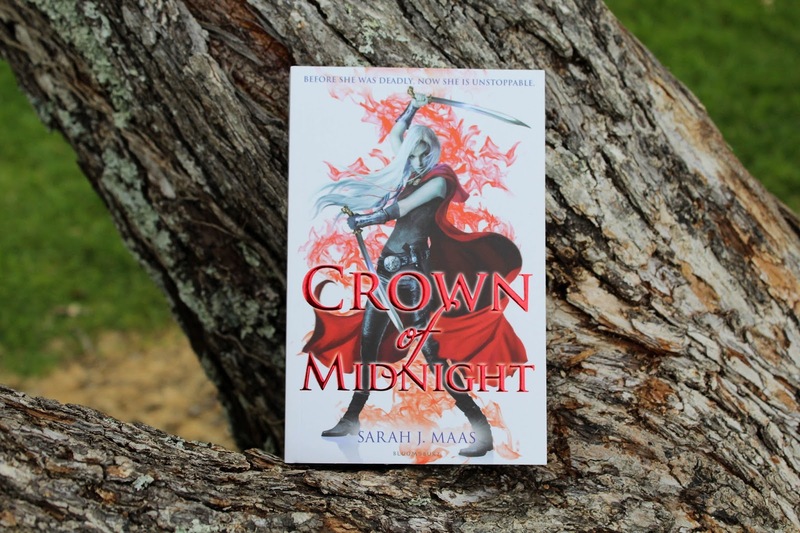 I hope that you enjoyed my review of Crown of Midnight by Sarah J Maas... Although I'm not sure it was a review, it was more of me fangirling over things that happened, I was completely unable to write anything else. I really did love this book. Go read it if you haven't already!